50.50 at the 2018 International Journalism Festival in Perugia, Italy.Lara Whyte (LW): Hello and welcome to the third episode of The Backlash, a podcast series by 50.50, the gender and sexuality section of openDemocracy. I’m Lara Whyte and thank you for listening. 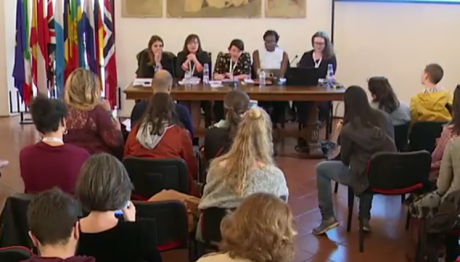 This month’s podcast is a little bit different, because we were at the International Journalism Festival in the beautiful Italian city of Perugia and we hosted a panel on why we need feminist investigative journalism. So we thought for this episode, we could give you a flavour of the conversation that we had there. On the panel, we have 50.50 writer Claudia Torrisi; we also have Rebecca Omonira-Oyekanmi, who is the co-editor of openDemocracy’s UK investigative section Shine a Light; and Crina Boros, an independent data-driven investigative reporter. Here’s the editor of 50.50, Claire Provost, starting us off by explaining what we mean when we say feminist investigative journalism. Claire Provost (CP): So I became particularly attracted to and interested in investigative reporting because of its promises, its very core promises, to uncover and expose abuses of power, to reveal critical new information in the public interest. So where are the investigative journalists challenging patriarchy, challenging structural violence against women, challenging intersecting forms of power and oppression? Now, of course, there are some incredible journalists who are doing this work, but they often do this thanklessly and with too few resources. And this is just not enough. The goal of our ‘Tracking the Backlash’ series is to demystify how international networks of ultraconservative and fundamentalist organisations are increasingly working together internationally to undermine [sexual and reproductive] rights in law, in policy, in media and other battlegrounds. So we see feminist investigative journalism as serious investigative reporting about women and LGBTI rights, but not only that. We want to produce important investigative stories in collaboration with other and with younger women and trans writers to also build their capacity, and thus our collective capacity, to investigate these issues. So it’s not just about what we write, but also how we write and how we work. "It's not just about what we write, but also how we write and how we work." LW: And so, Claire, why do you think this hasn’t been happening so far? CP: This is something you and I have talked about a lot. And I think there are a couple of reasons, and one of them is about the structure of newsrooms and the structure of media organisations that are – you know, this is no surprise – are often very male-dominated, particularly when you look at who holds power in these spaces: who the seniors editors are, who the commissioners are, when you look at job titles and responsibilities and the freedom that individuals have within newsrooms to pursue things that interest them. In the US, there was one really striking study from the Women’s Media Center, which is a non-profit that tracks issues like these, that looked at when reproductive rights, for example, are covered in the media – when they are covered – it’s more often by men. And they produced a study in 2016 that looked at 12 major outlets in the US and found, for example, that at The New York Times men authored nearly twice as many reproductive rights stories as women did. And that men are were also quoted more often in these stories. And if the exclusion of women’s voices in debates around our rights is part of the problem, then why do we accept this? Because who speaks and who frames issues in public debates, it really does matter. And in addition to this, our very male-dominated newsrooms are often filled with a really ultra-competitive atmosphere that kicks questions like this to the curb in the race for my byline, my story, my moment, my recognition, my career, my promotion… always about the individual. And this doesn’t encourage collaboration or mentorship or solidarity between reporters. And it can also reproduce and really fail to challenge extremely disempowering and damaging power dynamics. "Who speaks and who frames issues in public debates, it really does matter." This isn’t to say that all women are feminists, they aren't; and it’s not to say that doing this work is easy, it really isn’t. But that doesn’t mean that the status quo is right, or that we should continue to abide by it or to support that status quo. Meaningful collaborations, working in solidarity with other women, supporting new writers, challenging corporate power, challenging fascisms, fundamentalisms, investigating structural violence this is also really difficult and delicate work, which I think is another reason why mainstream organisations, in particular, might not choose to focus their time on these areas. We spend a lot of time with our writers. We spend a lot of time getting to know them, working with them, developing relationships, editing their pieces really carefully, explaining our edits, engaging in a back and forth that most news desks and editors wouldn’t dream of. It would seem really inefficient. But our goals are different; our goals are also very explicitly about challenging the exclusion of women’s voices, of trans women, of women of colour, politically-radical women, working-class women, challenging the exclusion of their voices from media and public debates – this is really core to what we want to do, but of course it requires significant care, time and resources. LW: Rebecca Omonira-Oyekanmi is an investigative reporter and the editor of Shine a Light which is openDemocracy’s UK investigative section. So, Rebecca, I wanted you to talk us through how Shine a Light covers state and structural violence against women. ROO: Our sources tend to be based in communities and actually living through an injustice rather than people with access to money and power who might blow the whistle on something. We cover structural violence against women where it’s related to the British government’s austerity program. That program began in 2008 in response to the financial crisis and it’s continued since then. 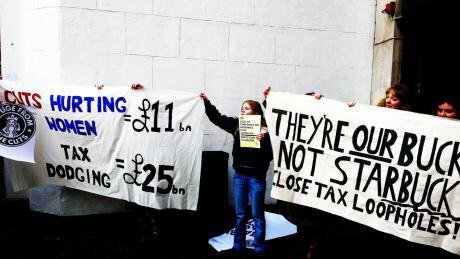 London women’s protest against austerity cuts. Photo: Rebecca Omonira-Oyekanmi.By austerity I mean cutting the role of the state in society – so that's less spending on public services like social security, which we call welfare benefits in the UK; that’s less money for local authorities; that’s cuts to legal aid for people who aren’t rich; and that’s a freeze on salaries of public sectors workers. It's also lowering taxes, saving money by cutting spending, and all of this hurts women most – that’s really well documented. There is a ton of statistics I won’t go through now. But, just broadly, the reason women are more affected by austerity programmes is because they are more likely to use public services; they are more likely to be in low-pay jobs in the public sector; and they are more likely to do unpaid care work when the government is no longer providing a particular social service. And all of these policy choices are very deliberate. Impacts assessments were produced and sent to civil servants and they still went ahead. And some of these policies seem to be a deliberate attempt to create an old-fashioned nuclear family where women are forced into financially-dependent relationships in order to survive. "Some of these policies seem to be an attempt to create an old-fashioned nuclear family where women are forced into financially-dependent relationships in order to survive." So, as you can imagine, there is a huge swathe of material to investigate. You've got public services that have been built over decades, usually by feminist activists, over time, that have become state services, and they are being rolled back through this policy. And one area that I have tended to focus on is the lives of black and brown women and working-class women because we have data to show that they lose even more than the poorest white women, so they are really hit by some of these policies, and they are also dealing with existing structural disadvantages. How does this play out in my work? In the long history of the battle for women’s rights and civil rights, and I include trans women in that struggle, personal testimony, and women talking and being listened to, has been crucial in forcing a public awakening that precipitates activism, protests, legal and policy change. But in the world of investigative journalism, it’s very masculine, so there are certain stories that are deemed worthier than others, and the voices of women just aren’t seen as a priority. In my reporting, I deliberately listen in a particular way, especially when I’m with women of colour, groups often invisible to wider society, in policy, in politics, in feminism – there are so many stories to investigate: the violence is pervasive and it’s hidden in plain sight. "There are so many stories to investigate: the violence is pervasive and it’s hidden in plain sight." One story I worked on was in collaboration with journalists in Scotland and Northern Ireland to tell the story of refugee women, and women with uncertain immigration status, trying to leave violent relationships… and there is this huge gap and there is this group of women who are not being helped. So I wrote about a smart young woman named Nabila who came to the UK from Pakistán and married a British man. Her migration status was a bit iffy; she didn’t have complete rights because she was in the UK on a spousal visa. He was physically abusive, his family bullied her, and one day she just decided that she’d had enough. So she went to the British police and instead of supporting her, and treating her as a victim of crime, they interrogated her. When she went to a domestic violence refuge, they asked “What’s your immigration status?” before asking, or even saying, I believe you. There is a gap in the law, basically. And it means that some migrant and refugee women in the UK who are there on a spousal visa can’t access certain public services. Nabila managed to somehow get out of this situation, leave her abusive husband, but she had nowhere to go, so what happens next? As part of my research, as well as interviewing women, one thing that I tried to do was to get data from the government. I sent Freedom of Information requests to the Home Office (they manage immigration). They said they don’t keep the data on domestic violence victims. I also sent requests to 34 local authorities across England and Wales, part of a network who are already monitoring migrants with precarious immigration status. Not one single council had kept any data on these women. One of the problems that I had, as someone who is trying to track what happens to women who aren’t white or who have uncertain migration status, is that sometimes the data isn’t collected. In another quick example, I worked with a university researcher on this. She was writing a story for me about the cuts to services for South Asian women and other women of colour in her area, and she found statistics on gender, statistics on race, but never statistics on both, and it made her feel invisible and frustrated. "She found statistics on gender, statistics on race, but never statistics on both, and it made her feel invisible and frustrated." LW: Thank you Rebecca. To move on to Crina – Crina is a freelance data-driven investigative reporter based in London, but from Romania. I wanted you to start by telling us how you started looking into gender-related stories as a data journalist. CB: Freelancers must find the underreported stories for a living. And I report on drivers of injustice, so I chase dodgy people, questionable business interests and harmful policies. To get a comprehensive understanding, I usually start with data analysis. When reporting on vulnerable groups, it is impossible not to find examples where women suffer the brunt of inequality. I reported on compensation policies implemented by the British Ministry of Defense (MOD) for victims in war-torn Afghanistan. A table I obtained via Freedom of Information laid out the sums the ministry paid out for each type of injury: partial blindness, $1,000; loss of a foot, $2,500; loss of both legs, between $2,500-7,000, etcetera. I found that women victims were compensated by default and design significantly less than men for the same type of injury. For example, if a man was accidentally killed by the British armed forces, his family would be compensated with anything between $8,000-12,000. Yet, if a woman was killed, her family would be paid between $5,000-8,000. And so on for pretty much every single type of injury, apart from one: facially disfigured women were compensated with more money than facially disfigured men because it affected their prospects of a good marriage, if any. Asked why they made this stark discrimination between sexes, the defence ministry of Britain said they were applying local customary laws. Case 2: I conducted two international polls on women’s rights in a small team of two. One examined endemic sexual harassment and violence on public transport in the world’s megacities. We interviewed over 6,600 women. Parisian women interviewees felt that no one will help them if they were attacked in a metro station or on a train at night. Women felt safer to travel in gender-segregated coaches or carriages in Latin America, while in India they reported being targeted even more for using women’s only transport vehicles. The most shocking aspect of this research, to me, was to find out that women around the globe choose their lives and livelihoods not around their aspirations, dreams or ambitions, but, say, on how long they will have to walk on a street with no public lighting – a seemingly banal aspect of everyday Western life. 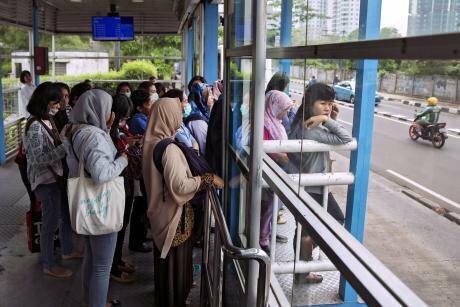 Women using gender-segregated public transport in Jakarta. Photo: UN Women/Ryan Brown/Flickr. CC-BY-NC-ND-2.0. Some rights reserved.Case 3: A look at outward migrations patterns in Romania’s most underprivileged areas shows that children left at home suffer when mothers are the first in a couple to migrate for seasonal work. Due to language similarities, Romanian women prefer to migrate to Italy, Spain and Portugal. Their departure, forced by economic circumstances, had led to children going through emotional trauma, burnout phases, spikes in child sexual abuse (especially in girls) and divorces. The migrating mothers are abused too. Their physical and mental health, self-esteem and civil rights suffer as they toil abroad, often in abject conditions. Strawberry farmers are discouraged from bringing their husbands, but they are strongly encouraged to bring other women from their village... these women have become the main breadwinners of their family. Underprivileged Romanian villages are experiencing a poverty-induced matriarchal revival. Data-driven investigations: they have the power of showing if a wrongdoing is systematic, whether it is scientifically-correlated with another aspect of life or politics. "Data-driven investigations: they have the power of showing if a wrongdoing is systematic." When you go about your reporting using a data-driven approach, there is a certain integrity in your findings. Sometimes you must write your stories around extreme cases; sometimes the average is the biggest anomaly you will ever find. Evidence-based reporting, rather than anecdotal, shelters both journalists and their sources, to some degree, from retaliation. It’s sometimes better to protect vulnerable sources when you have a database, that’s an inanimate object: you can’t kill it. Most of the times, with data, you don’t assume, you know. LW: Claudia Torrisi is an independent reporter who writes a regular column for us. Claudia, a lot of your work for us focuses on violence against women. Why? CT: I think that violence against women is one of the best examples of why Italy needs real feminist journalism. In Italy, the mainstream media talks a lot about stories of femicides, women killed or abused by their partners, raped by strangers. Newspapers and TV programmes are full of these kinds of stories. The problem is that telling stories about women is not the same thing as telling women’s rights stories, and too often the caution and the care that should be applied to reporting on such a critical issue is absent. Italian media too often use a sort of romantic frame to talk about these stories. The murder is often presented as a crime of passion. You can read words like sick love, jealousy – it is really unbelievable how widespread this narrative is. If you do a quick search on Google, with the words in Italian “killed for jealousy” (uccisa per gelosia), you will see an incredible number of results. An example: last month in Sicily, a 20-year-old girl was stabbed to death by her boyfriend and there were plenty of articles and headlines saying that he killed her for jealousy. But if you dig a little into this story, you find that the relationship between that girl and her boyfriend was far from being perfect and healthy. She had been beaten up by her partner several times, but she had never filed a complaint with the police. "Telling stories about women is not the same thing as telling women's rights stories." So I think that is why this narrative, full of stereotypes and this romantic frame, is dangerous – because describing the violence as linked to individual responsibilities leaves out from the story the roots of the violence, which are patriarchy, unequal power relations between women and men, discrimination. There are a lot of issues related to femicides and violence that need to be investigated. For example, a lot of victims had filed complaints to the police before being killed. So the question is: why are Italian laws and authorities failing to protect women from violence? Or why do women’s centres and refuges have so many difficulties in carrying out their activities? Why are many of them about to close? Or, another example, why is Italy unable to set school education programs to prevent violence? Something is changing now, thanks to groups of female journalists and researchers who are trying to reconstruct the way we talk about violence against women in Italy. There are initiatives, education courses, protests when there is bad coverage, but still, this narrative is predominant, so we definitely need better reporting on violence against women. LW: You give us one of our biggest hits on 50.50 when you looked into the Weinstein scandal and how the Italian media were reporting it. Do you want to tell me about that, and what was different about how it was being reported in Italy, compared to other countries? CT: One of Weinstein’s accusers was the Italian actress and director Asia Argento who told The New Yorker she was sexually assaulted by Weinstein in 1997. That’s the reason why the Italian media gave significant space to the scandal, but instead of focusing on Weinstein, they scrutinised the victims. We can definitely say that, in Italy, the Weinstein scandal quickly became Asia Argento's scandal. The debate here got stuck in show business and was treated by the media as gossip. It seems that industries all over the world had their own moments of reckoning inspired by the Weinstein scandal, while we did not have any. Here the discussion around sexual harassment at work remains a sort of taboo. This is, of course, a cultural problem and it shows how much sexual abusers and harassers can feel safe in this country, but this also has to do with the Italian media industry which is a world in which the power is all in male hands. So the real problem is that narratives are shaped by men who are in power and we know that harassment is about power. "The real problem is that narratives are shaped by men who are in power and we know that harassment is about power." Our National Institute of Statistics estimated that 8.2 million Italian women between 14-65 years old have experienced sexual harassment in their lifetime. 1.4 million women have experienced physical harassment or sexual blackmail in their workplace. What's more: 80% of these women said that they told no one at work about the incident; almost no one had reported the incident to the police. So we need feminist investigative journalists to uncover this system of harassment and abuse in every working field, including the media, and to tell these underreported stories to create safer spaces for women to share their experiences. LW: That’s it for us. Join us again next month. You can tweet us at @5050od or @Backlash_Track. Feel free to give us a bell, let us know what you think, give us some ideas, feedback also welcome. You can email us, or you can find us on Facebook. 50.50 is an independent feminist media platform. You can support our work by donating on our website. Help us track the backlash against women’s rights. This episode of The Backlash is an edited version of 50.50's panel at the 2018 International Journalism Festival in Perugia, Italy, chaired by Lara Whyte. Audio editing and music production by Simone Lai. Produced by Lara Whyte and Claire Provost; assistant producing by Rocio Ros.